Kanyarkali is a folk dance ritual performed in Bhagavati temples and Vettakorumakan Temple of Palakkad district. The kali (play) is presented by members of the Nair community to propitiate Bhagavati. The dance is performed at night for four consecutive nights. The dance ends at dawn. The dances begin with the men of the community gathering in the temples and performing a rhythmic circular dance called Vattakali. 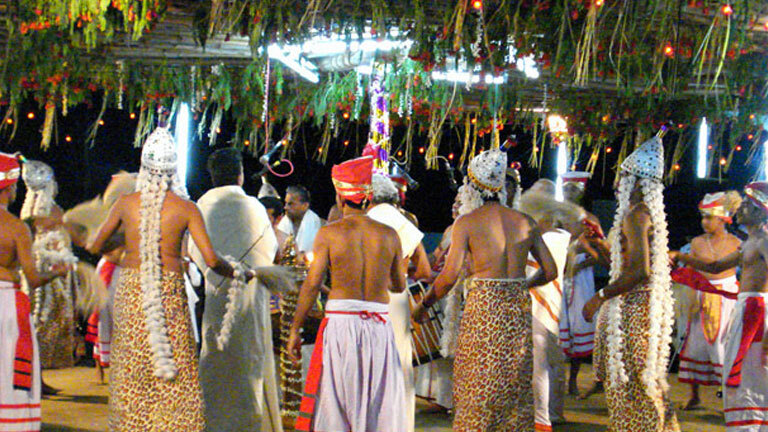 Vattakali is a ritual, it is followed by Purattukali, an entertainment. Purattu literally means farce. Just before the kali, kelikottu is done heralding the beginning of the main play. In most places, the play begins at eight at night. The first item is ‘nadavattom’. It is a ritual of the players entering the square stage called pandal. The Kaliyachan or the main singer recites the vaythari and the performers play accordingly. The players sing and dance around a lighted traditional lamp. There is no particular costume. The players wield sticks with bells attached to it. According to the song the players dance in different rhythmic movements. The rhythmic movements gain momentum and the kali reaches its finale. And naduvattom comes to an end. When one round is over, the komaram (oracle) enters the pandal, dances in frenzy and finally removes the sword. Vattakali is performed thrice. Naduvattom is followed by a kali with songs sung by singers who occupy the central position of the stage. Towards the end of the song the dance is performed in a slow tempo. In the third Vattakali, songs are sung in praise of Bhagavati. The second part of Kanyarkali is the performance of Purattu. On the first day Iravakali is performed and on the second day, it is aandikoothu. The following days Vallon and Malamakali are performed. Prominent instruments that serve as accompaniments include Chenda, Maddalam, Edakka, Udukku, Ilathalam, Chengila and Kurumkuzhal.